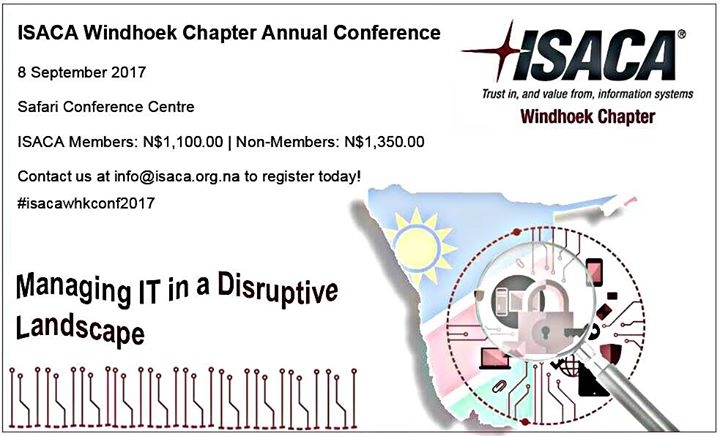 The ISACA Windhoek Chapter will be hosting its first Conference on the 8th of September 2017, with the theme “Managing IT in a disruptive landscape”; at the Safari Conference Centre. The conference will consist of specialists’ presentations as well as an experts panel discussion which will focus on our conference theme. All attendance and/or registration should be confirmed by end of business day, Monday, 4th September 2017. For more information on this networking event, including attendance confirmation, please contact us at info@isaca.org.na.